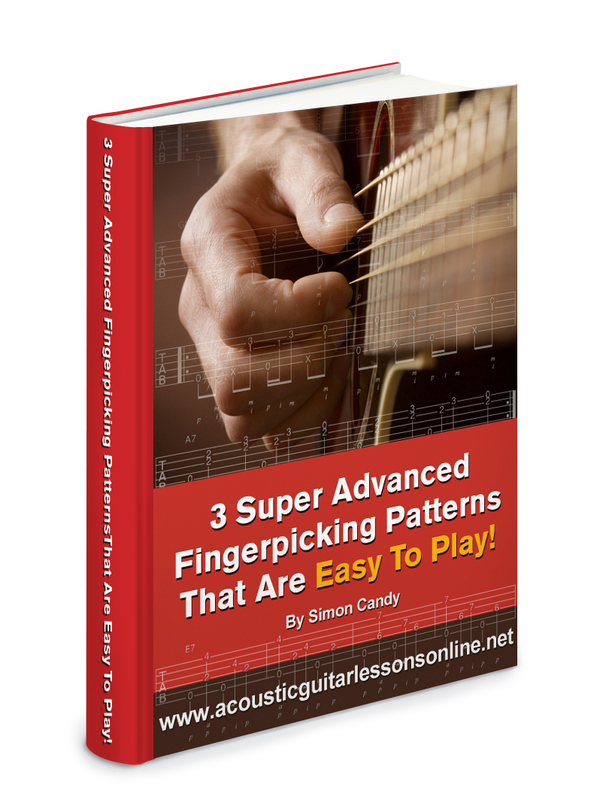 3 Super Advanced Sounding Fingerpicking Patterns That Are Easy To Play! Are you sick and tired of playing the same old fingerpicking patterns on your acoustic guitar? Sure, they sound ok, but how about learning some patterns that will have people stop what they are doing just to hear you play your guitar. I'm talking about super advanced sounding fingerpicking patterns that not only sound awesome, but are easy to play AND easy to apply to any musical situation you like! Well, give me 5 minutes and I'll show you how you can play killer advanced fingerpicking patterns on your acoustic guitar with ease. Rid yourself of any frustration you have had in the past with fingerpicking on your acoustic guitar. You will feel so much more confident, satisfied, and self assured with your guitar playing! Learn a bunch of advanced sounding stuff that is easy to play! Get INSTANT access to your FREE ebook and audio on "3 Super Advanced Sounding Fingerpicking Patterns That Are Easy To Play" by typing your name and email address into the box below and clicking "Give Me Access Now"